Volkswagen (VLKAY (VLKAF is looking to move on from the emission scandal that not only cost it billions of dollars in fines, but also its reputation among those who care for the environment. In lieu of those past developments, the company is making a stronger push toward electric vehicles (EVs) -- and as other automakers like General Motors (GM - Get Report) , Daimler (DDAIF , BMW (BMWYY and Ford (F - Get Report) make the same push to dethrone Tesla (TSLA - Get Report) . To get started on its noteworthy electric journey, Volkswagen developed and built the MEB platform (in German its Modularer E-Antriebs-Baukasten). This is essentially the building block for not only Volkswagen's planned electric vehicles, but also the platform that will be used for several of its brands. This includes Audi, Skoda and SEAT. "The idea is, VW will save EV startups R&D costs and provide critical components at a lower cost. 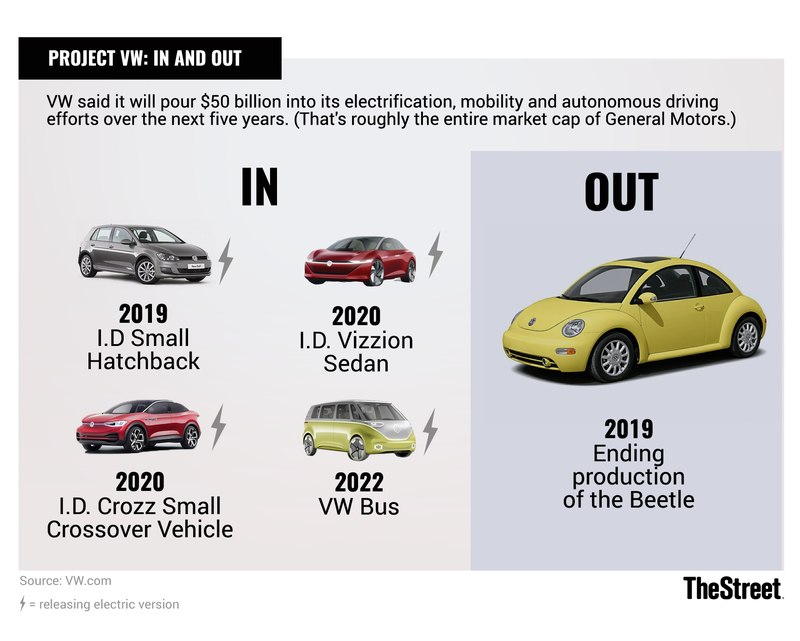 While this benefits EV startups (early-stage electric vehicle manufacturers that produce less than 25k cars a year), Volkswagen also stands to gain longer-term, if these startups mature into bigger companies and by achieving greater economies of scale in EV manufacturing." The startup he's referring to is e.GO Mobile, a German electric vehicle company, and while startups offer Volkswagen long-term potential, the real benefit would be if an established automaker stepped up. Specifically, how about Ford? The two companies have already announced two separate partnerships. First in January, the two announced their pact on a collaboration on trucks and vans. Then last month, Volkswagen made a strategic investment in Ford subsidiary Argo, a self-driving tech company. Volkswagen and Ford are clearly comfortable working together, particularly in ways that curb some of the massive R&D spend that is required for developing future transportation solutions. In this regard to research and development, EVs and autonomous vehicles are two of automakers' largest expense. Ford may find it advantageous to team with Volkswagen by using its MEB platform in the same way that Volkswagen found it worthwhile to invest in Ford's Argo. We've seen other mentions of electric platform use too, most notably with Tesla CEO Elon Musk saying he would be open to using Tesla's drivetrain, battery and "compute tech" on a Daimler's Mercedes vans. At the end of the day, it's very clear that there are strong trends toward electric solutions and that will drive automakers to choose the most effective routes. For some, that may mean using Volkswagen's MEB platform.